Now that the weather has turned a bit chilly, you might be craving something warm and sweet for breakfast. If so, why not try a Hot Cinnamon Apple Smoothie? If you happen to have my most recent superfood cookbook, you know I make a lot of “blender foods”—which of course include lots of smoothies! I just love the whole concept of putting all sorts of good-for-you ingredients into a blender, pressing a switch and presto!—a delicious, nutritious and easy-to-transport breakfast (or snack) is made in minutes. But, when the weather gets a little cooler, I realize the sound of an ice cream cold smoothie isn’t nearly as appealing as it might otherwise be in the warmer summer months. But that doesn’t mean you need to resort to coffee cake for breakfast! Luckily, apples are the perfect seasonal fruit to enjoy warm and blended into a smoothie that tastes a whole lot like apple pie. If you have kids, I promise the Hot Cinnamon Apple Smoothie recipe will be a hit! In fact, the first time I made it for my son (in the photo below), he asked for it for breakfast four straight days in a row! 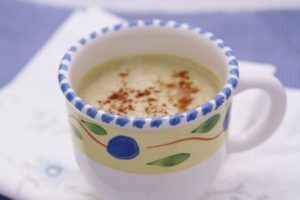 The fragrant cinnamon is added to my apple smoothie recipe not only for the significant role it plays in boosting flavor, but also for its anti-inflammatory benefits. Like other spices, cinnamon offers a wide variety of disease-fighting phytonutrients that have antioxidant and anti-aging benefits. If you have read our Clean Cuisine book, you know all about the many benefits associated with boosting your intake of phytonutrients (you can read more about the benefits of phytonutrients HERE). Well, it turns out, cinnamon contains a variety of super powerful phytonutrients, including the class similar to those found in grapes, berries, cocoa and green tea. The special type of phytonutrients found in cinnamon have an amazing ability to stabilize blood sugar levels, prevent fat-storing insulin spikes, protect the body from damaging free-radicals, and, most amazingly, actually have the ability to “turn on genes” within our body that produce highly protective anti-inflammatory substances. And if all that isn’t enough to make you want to start putting cinnamon on everything you eat, did you know cinnamon can even boost the appearance of your skin and help protect against premature sun damage? But, you can’t just sprinkle on a teeny-tiny dash of cinnamon, you need to get a “therapeutic” dosage—at least 1/4 teaspoon or so—in order to really get the benefits. The apple smoothie recipe has 1/2 teaspoon, so it is definitely enough to make a difference. Add the apple-raisin mixture to a high-speed blender. Add the pecans and ¾ cup warm water. Process on high for 1 minute, until smooth and creamy. Pour into a coffee mug and drink warm. ***WARNING! I have a non-glass blender jar with my Vitamix high speed blender, but if you have a glass blender jar you need to be extra careful that you let the ingredients cool to almost room temperature before you put them in the glass jar otherwise the glass could explode and cause serious injury. P.S. If you love the Hot Cinnamon Apple Smoothie, be sure to check out the Warm Banana Smoothie too! I am abit surprised that you use a microwave. Haven’t you heard of the hazards? Yum! Now this I may actually have to try it sounds delicious. You mentioned in your warning that you use a Vitamix blender. I was reading a couple of blogs on them the other day, what is your opinion of the Viamix? I understand that organic food are better for you but they are also more expensive, this recipe will work just fine with a regular apple right? Hi Erica – I understand your cost concern about organic apples. It would work but due to the number of chemicals/pesticides use on apples – I always recommend going organic with them. This sounds really yummy and I can’t wait to try it. It does sound like it’s rather high in carbs as well but for a breakfast that doesn’t matter as much. Thank you for the recipe I will let you know how it turns out. You always have such great ideas and recipes for delicious foods. Thank you for posting and I hope that you continue. Do you have a cookbook that I can order? I had to write this recipe down so I can try it later for a warm desert after dinner. Thank you for the warning about the glass pitcher on the blender that could potentially make a huge mess. What is your opinion of the Viamix blender anyway? I was thinking of getting one because my blender doesn’t pull the food down into the blades anymore, but they are rather expensive. I think this is something that my whole family will love. Thank you for the recipe I will let you know how it turns out. You always have such great ideas and recipes for delicious foods. Thank you for posting and I hope that you continue because I missed you there for awhile. Are you back for awhile now? I can’t tell you how much your articles have impacted me. Thank you. Like the writer of the article, I too love smoothies. And what I love even more than smoothies is the taste of granny smith apples. I like that tangy taste over what I think is a rather bland taste of red apples. That’s also why my favorite Martini drink is a Sour Apple Martini. Okay, Okay, I know everyone here is all about healthy stuff, but admit it, that is a tasty drink. Thanks for this recipe. Thanks Kristen. Yes – the smoothie is not boring. Enjoy. Can’t believe I forgot to comment on this… the notice about the new Bannana Bread Smoothie you are sharing today reminded me…. we have made this at least 3 times over the last week to great success! The kids (and my 65 year old father) love it… and we have tried it with different dried fruit that we have had on hand (dried craisons, plums and prunes seem to work great too.) It really fits the bill for breakfast in that you have that full, nourished feeling but, just like a cold smoothie, you don’t feel weighted down starting your day! Keep up the great work! I so appreciate your point of view regarding food and recipes. The Apple smoothie is really awesome. It’s really quick and easy to make. I made this last week end. My husband and kid enjoyed it a lot. It was very tasty. Thanks for the recipe. It’s very nutritious. My son needs it every day after his football. Cheers! We are here in new Jersey and getting close to a foot of snow today. It was the perfect morning to try the warm apple smoothie. My husband and I really enjoyed it, and it is so easy to make. You can double the recipe and it still fits in your Vitamix. Made mine with milk instead of water, left out the nuts, and added some vanilla. Very good! Omg Ivy! Once again you amaze me with your recipe! This is the best thing ever!! So delicious! I didn’t care for the raisins in smoothie. I’m iffy on raisins anyway; I can tolerate them in an oatmeal cookie, but I don’t really like them. So if you don’t like raisins, you might try sweetening with dates. I’m going to try that one of these days. Ivy, thank you for all the recipes. I make so many on a regular basis! I got some pretty awesome and strong powdered cinnamon and some sticks from raw food world. It is from Ceylon I believe. I have to use much less than normal and with the powdered cinnamon I can make some super tea. Just a 1/4 tsp in some hot water makes a lovely cup and it’s sweet on its own. Look and see if they still have some. It’s WOW. I make my own raw apple sauce with it too. I recommend you do more research on microwaves. What they do to the actual structure of the food is far different than normal cooking. In fact there is more than one research study where the animals exclusively fed microwaved food all died of starvation. Though microwaves were originally invented in Russia they were totally outlawed there in the ’70’s because of their deleterious effects. There is tremendous evidence regarding the harm and danger of consuming microwaved food regardless if you screen the waves themselves. Please consider some more investigating as your comments influence so many. Thank you! Hi Kanta, I am so sorry for the delay getting back to you as I have just been super busy. I very much appreciate your comments though. I also really appreciate your respectful tone as sometimes we can get some pretty nasty comments from people who disagree with our opinions. I most definitely always keep my mind open and would very much like to look into this further. Do you happen to have any links to specific research you might be able to share? Or do you maybe have a link to a well-written article with more information? Thank you for taking the time to comment on this too. We all learn SO much from each other! Is it possible to blend it first, then put it on the stove to warm? It sounds like this would be much safer and not cause any explosions.